In the world premiere of a new musical devised by Australian TV icon Steve Vizard and legendary jazz musician Paul Grabowsky, Banquet of Secrets, four friends unite for their annual dinner and secrets are spilled in a celebration of food, friendship and life. In a city with a love of food and music theatre, Victorian Opera serves up a new musical to delight Melbourne audiences while continuing its commitment to present new Australian work. Company favourites Antoinette Halloran, Kanen Breen, Dimity Shepherd and David Rogers-Smith return to the stage of Arts Centre Melbourne’s Playhouse, following their star turns in last year’s box-office hit, Sweeney Todd. Four lifelong friends gather at their favourite restaurant and during an elaborate meal, each reveal their deepest secret. As secrets are spilled and food is consumed, old memories unexpectedly find new voice in the company of friends. Roger Hodgman returns to direct following his acclaimed Victorian Opera productions of Nixon in China (2013) and The Flying Dutchman (2015). He will be reunited with Steve Vizard and Paul Grabowsky following their comedy, Last Man Standing for Melbourne Theatre Company in 2015. Banquet of Secrets marks the first new musical commissioned by the company. 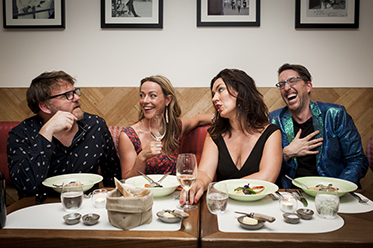 Presented in partnership with Arts Centre Melbourne and as part of the Melbourne Food and Wine Festival, this musical will be a treat for lovers of food and music alike, featuring an on-stage menu created by celebrity chef Philippe Mouchel (PM24, Déjà Vue).